LOW BASS IS apparently an elusive thing. It shouldn’t be but audiophiles, music lovers and boy racers always seem to be in search of bass. More bass, deeper bass, louder bass tighter bass (well, maybe not the boy racers for that last one). Reviews are often filled with superlatives, justifications and solutions to the bass quandary. The headphone and earphone market is no different. When the drivers are millimetres from your ears, and your ears are actually part of the speaker system, then bass characteristics are extremely obvious, for better or worse. Adding bass to head-fi based music is nothing new as anyone who ever owned a ’80s Walkman with some kind of Mega-Bass switch can tell you. Smartphones and MP3 players have all kinds of equalisation systems built in, from simple equalisation sliders, to branded solutions such as Beats Audio from the good Doctor himself. I’ve reviewed a bunch of headphones designed to augment bass over the years. Some offered a small nudge of bass power and depth, often without making any bold claims on the packaging. Others such as Sony’s recently reviewed Extra-Bass ‘phones (reviewed here) brought more than a little bit of additional bass to the table and were specifically aimed at a segment that wants BASS, not just bass. 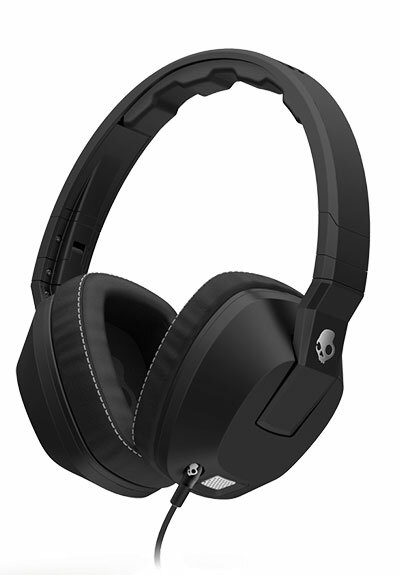 However, Skullcandy has come to the party with what has to be the most insanely dedicated big-bass solution in the entire street-style headphone market. The new Crusher ‘phones haven’t got time for feeble tuning of the drivers and enclosure to get more bass. Instead the Skullcandy engineers have decided that to provide more bass, they need to follow the rest of the audio industry by implementing powered subwoofers. So they’ve included a second set of drivers, which are powered by an on-board battery. These drivers are designed specifically to boost the bass and they do it like nothing I’ve ever heard, or felt for that matter. The Crushers are an over the ear, folding design, using fairly big and deep enclosures, complete with internal and external porting. Inside the right enclosure is an AA battery (with 40 hours of claimed battery life), powering a set of Sensation55 drivers, which are actually part of a vibration system – the intent here is to provide bass that’s physical at a level well beyond the norm, so the drivers are designed to move more than just air. The battery is easily accessed by popping off the earpad, which is handy. The built-in Class D amplifier is fitted with a music sensing circuit that turns on when signal is detected and off within 10 seconds when the action stops. Bass levels are controlled via a slider on the rear of the left enclosure, and with the slider all the way down, the powered drivers are in fact totally powered down. A set of Skullcandy’s REX40 drivers covers the rest of the frequency range – these drivers are the same type as found in the Navigator model (reviewed here) but here they’re tuned to these specific ‘phones. The build quality is good without being exceptional. Sony’s similarly priced XB-920 ‘phones look and feel more premium, as do Skullcandy’s own Navigators. The dull matt finished black plastic on the big enclosures and the headband just looks ordinary, while the white finish Crusher looks more upmarket. 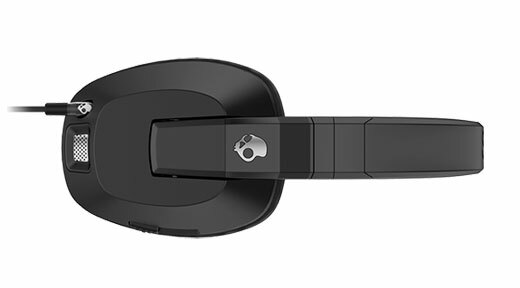 According to Skullcandy, the engineering team used “standardised anthropometric data to develop the Crusher’s flexibility and clamping pressure”. It certainly seems to have worked because between the thick padding on the headband and the copious but reasonably firm padding on earcups, these ‘phones are comfortable despite being relatively heavy. There’s a fair degree of clamping pressure on the side of the head but it’s not a major issue and most importantly for this writer, the earcups are big enough that the user’s ears aren’t crushed like an abandoned car in a scrapyard. There’s a decent amount of adjustment on the headband and plenty of movement and articulation in the design, so it’s easy to find the comfort sweet spot. A detachable cable is supplied – it’s described as “tangle-resistant” and it really does manage to avoid turning into a fisherman’s nightmare. An in-line remote and mic is fitted but because it’s designed to work with a number of devices, it doesn’t offer volume control, just music and call control. This is a huge pain if you’re an Apple user who’s used to fully functional remotes but Android users will no doubt rejoice. Powered down, the Crushers sound much like the much simpler Navigators, which I rated very highly indeed. Actually I bought a set of the blue Navigators and they’ve become my default gym ‘phones and are used around the house all the time. The Crushers however, aren’t tuned with the Navigator’s big bass peak – after all, who needs tuning when you’ve got subwoofers? So with the secondary drivers off, the Crushers offer moderately tighter bass, albeit not as deeply extended or as punchy. Their bigger enclosures also allow the drivers to sound a fraction more spacious, with a clearer midrange. With the bass circuit off, compare a bass heavy track like the epic ‘Stand Inside Your Love’ from Smashing Pumpkins’ Rotten Apples and you might well swing either way. The Navigators are bigger in the bottom, while the Crushers sound a tad restrained in terms of sheer bass weight. However, crank the Crushers’ bass slider all the way up and things rapidly go nuts. The audible bass on the Crushers is enhanced, dramatically so but the ‘phones also start vibrating wildly in time with the music and the sensation is like having two bass drivers strapped to your head, or being too close to a bass bin at a concert or in a club – gee, imagine that. The bass on these things is hard to describe because it’s a somewhat unique sound. Most of the time, the sense of movement and shifting air is more obvious than the audible boost provided by the Sensation55 drivers. The bass circuit is definitely more suited to certain types of music but just like the Sony Extra-Bass models, these ‘phones are aimed at a specific market, and with the right music, the bass is addictive. It’s a slightly hideous accompaniment to mellow acoustic stuff but you can just turn off the powered drivers. With tracks from RATM, AWOLNation, Dr. Dre and the like, I found that the bass slider stayed about half way up, and that I genuinely missed it when it was off. These ‘phones are great for motivation at the gym when all that bass energy is just what’s needed. The rest of the frequency range is respectable enough. There are no doubt a number of similarly priced ‘phones that’ll match the Crushers in terms of detail reproduction, others that are more linear and yet others with a sweeter overall sound but there aren’t any that I’ve encountered that do bass like these ‘phones do. They make Sony’s big bass models feel a little anaemic but just like those ‘phones, they need the right mindset to be enjoyed for what they are. They’re reasonably versatile though, in that they’re not all bass, all the time, and like most of the Skullcandy ‘phones I’ve tried, they’re a lot of fun to listen to. How does these compare to the Skullcandy Navigator?And does the bass affect the other frequencies a lot?Overall, which is better suited for pop music?